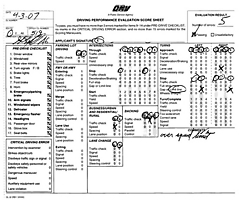 Once you have scheduled the behind-the-wheel test you have to go to the DMV to have the test with your own car. Having a perfectly working and insured (with you as a driver) car is required. It is the first check they do in the test and you have to come back another day if the car is not ok. A rented car is ok for the test, as long as you are one of the allowed drivers in the rental contract (that you have to bring with you). As soon as you arrive to the DMV, go inside to check in and then go in line with the car for the test (at least, this is how it works in San Diego Clairemont). 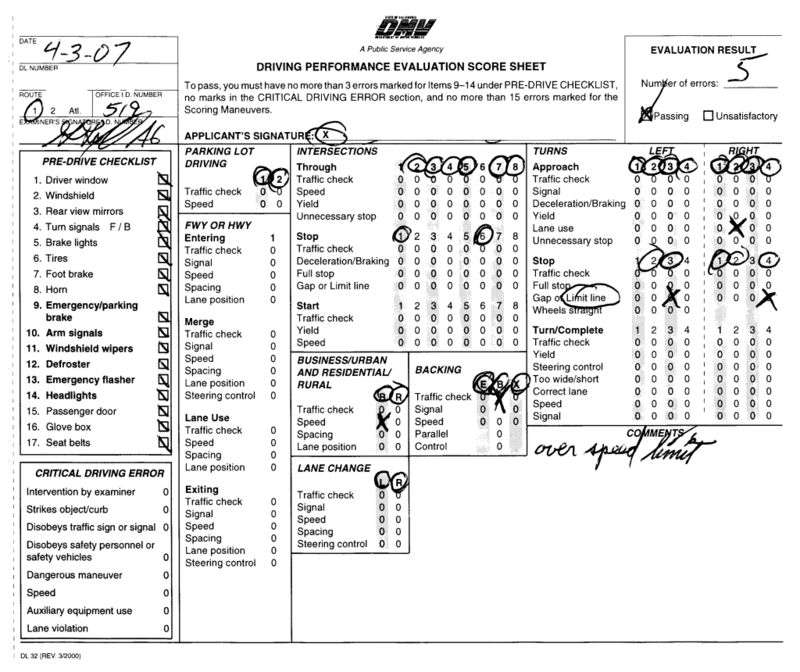 The pre-drive checklist is the first thing you have to do, at the beginning of the test. You can see the checklist in the far left column of the attached score sheet. The parking lot driving and the driving test consist only in following the instructor directions respecting the rules. The instructor will make you drive as long as needed, so that you complete the required number of maneuvers (8 intersections, 4 turns left, 4 turns right, …). He or she will mark on the score sheet every error (see attached score sheet). Don't worry too much about errors: you can make 3 errors in the pre-drive checklist, no critical errors (see the bottom left corner of the score sheet) and 15 (!) errors in the driving test. You shouldn't have any problem in passing this if you already have a driving license. remember that if you park on a slope, you have to turn your wheels accordingly (see the handbook); not only for the test, they fine people for that! If the test is passed, you'll receive your driving license at your mailing address in more or less 10 days.